Step 1: Go dumpster-diving. Rescue 7 wooden pallets for a 2 section bin or 10 pallets for a 3 section bin. During a brief stint as a horticulturist, I discovered the beauty of compost. By horticulturist, I mean that I worked as a seasonal clerk in one of the local plant nurseries. And by beauty, I mean the lovely, smelly, rotten, earthy mush that somehow becomes new plant life. It’s not for the fainthearted. But you have to admit that it is a pretty remarkable transformation. Unfortunately, at the outset of my compost fascination, we lived in a small apartment. Admittedly, I knew of people doing worm compost in their apartments, but I couldn’t figure out anywhere to put the worm compost bin that wouldn’t make the entire apartment smell. Step 2: Learn to use a drill. Fortunately, I was able to feed my compost obsession by sealing all our rotting fruits, coffee grounds, house plant leaves, and veggies into previously-used plastic yogurt containers and passing them off at church. At this time, our group of 20-and-30-year-olds was attempting a community garden, which wasn’t really successful due to the inconvenient location of the garden and the busyness of everyone’s schedules, but all of us were very good at generating rotting vegetable matter. 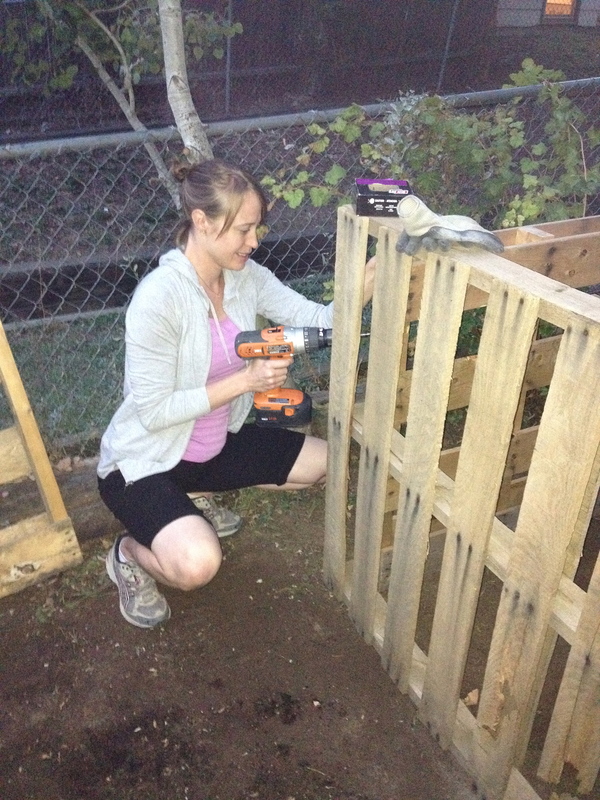 Step 3: Screw the pallets together leaving the front open (for easy shoveling out and turning over of compost). Set aside 2 separate pallets for the front panels. Exchanging pounds of compost in the church parking lot is a little absurd. On the other hand, it seems like it could be a theological metaphor–something about dumping our rotten stuff and praying that it’s somehow transformed into something much better. Keith and I were the best rotten-vegetable-matter generators. The other 20-and-30-year olds were very impressed with our healthy eating. Actually, we generated compost because we were overly optimistic about the number of vegetables we would manage to cook during the week, and so we routinely had to clean out vegetable sludge from the drawers of our refrigerator (see my upcoming post on What NOT to compost). Step 4: Over the two separate front pallets, staple chicken wire. These two pallets will be set in place as the front but will be held on by looped wire instead of by screws. After recently moving to a house of our own, one of the first things we did was start a compost pile. We tried two or three different locations in the yard before settling on one halfway between the house and the back fence. Lesson one: if your compost pile is too far from your house, you will not want to make the trek out to dump the compost. Once the location had been determined (and the other small, abandoned compost heaps had been removed from their various positions), it was time to build a compost bin. Now this step wasn’t strictly necessary because a heap of compost composts itself just fine without being contained. But a heap of rotting plant matter is a bit unsightly, and to maintain neighborly relations, it’s best to keep your compost from becoming a compost blob, so we set out to build a bin. There are some great plans for compost bins on the internet. One of the blogs I read about compost bins reviewed some different types of bins. The author finally chose to use plans from Lowe’s to build his…for the low price of $350! 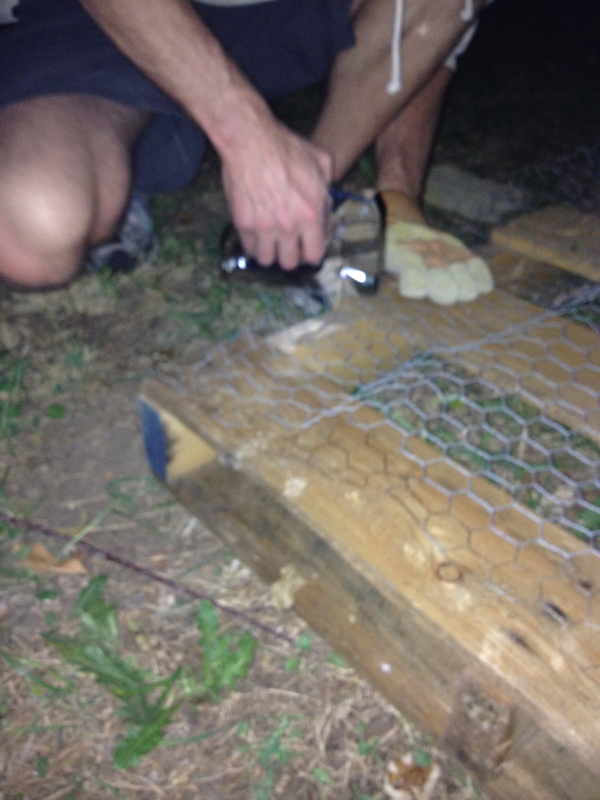 Step 5: Roll chicken wire around inside and outside of the pallets and staple into place. This keeps critters from getting in but still allows your compost to breathe. 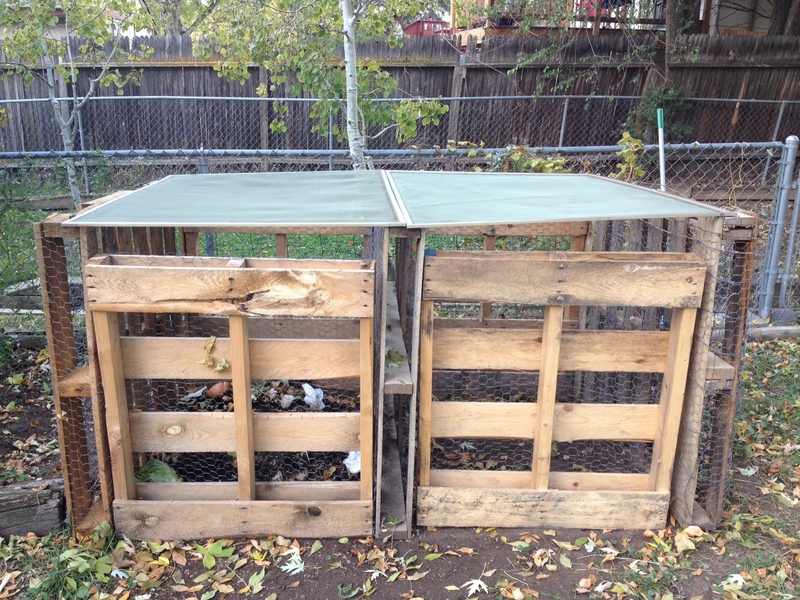 We found the chicken wire in a dumpster, but you can also buy it cheaply at a used building materials store. What we finally ended up with probably won’t last quite as long as his, and it doesn’t look quite as nice as his, but I figure that it’s going to be holding rotting plant refuse. 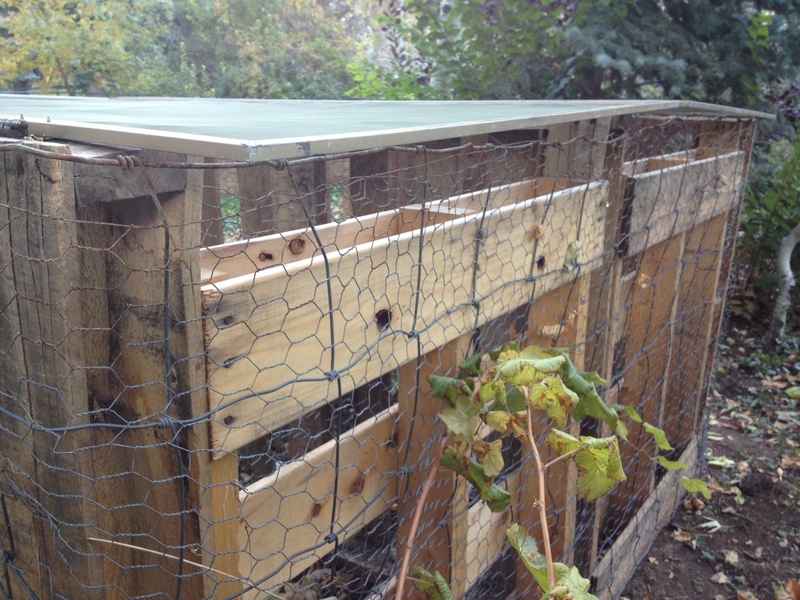 End result: 7 wooden pallets, a roll of chicken wire, two old window screens, and some old hinges make a pretty sturdy containment system with two sections–for the thrifty price of $6.37 cents. I also feel pretty good about saving 7 wooden pallets, a roll of chicken wire, two old window screens, and some old hinges from the landfill. 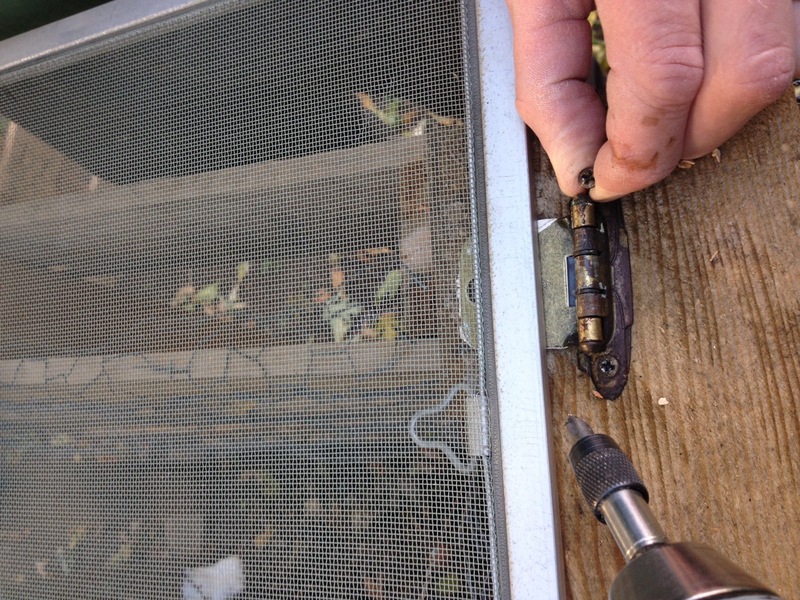 Step 6: Using old hinges (these are from cabinets we replaced in our house), attach screens to the top of the bin for easy open-and-close lids. We bought the screens from the Habitat for Humanity ReStore for $3.00 each. They were the one material we purchased. Keith felt a little less good about my dumpster-diving habits when I had to call him at work last spring and ask him to bring his truck to pick up the 4 pallets I had found (which, surprisingly, wouldn’t fit in my small Nissan Altima). I stood guard by the dumpster until he came. I thought it too risky to leave such valuable materials by themselves. Who knew how many other dumpster-diving compost-bin-builders there might be to swoop in and steal my find? Step 7: Set the two front panels in place and hold closed with twists of wire. This way, you can remove them to shovel compost out or turn compost over. To dump your daily compost, just open the screens! 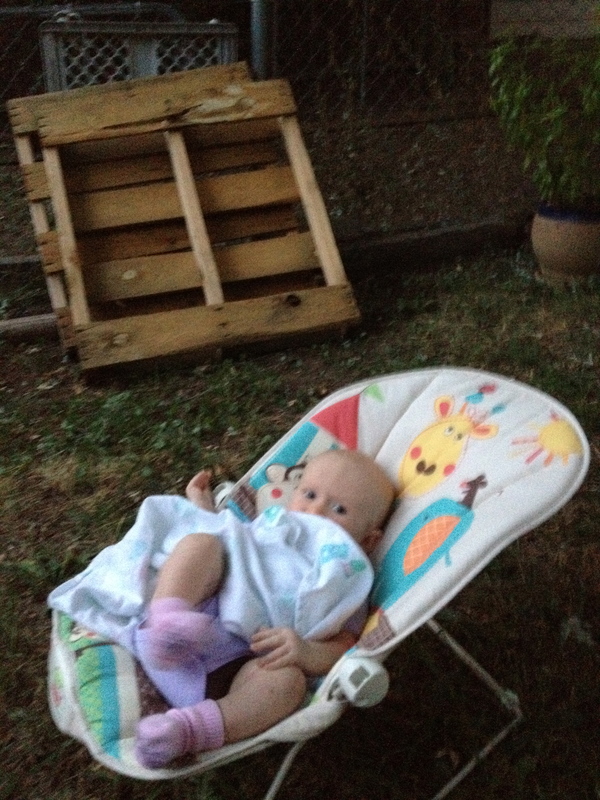 Little Bear helps us build our compost bin by entertaining herself. We’re instilling sustainability values early on. 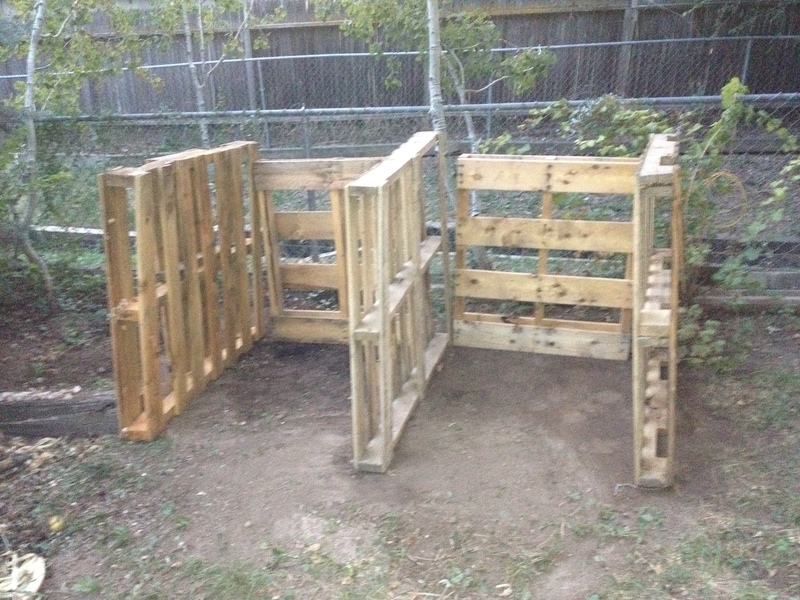 It only took us three half-hour sessions to build the compost bin. This is good. 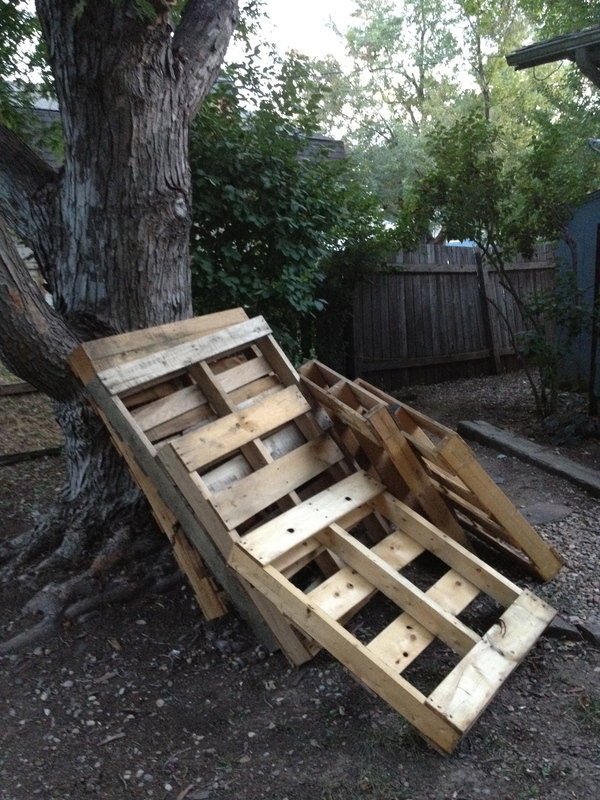 When the wood pallets decompose, it won’t take us long to reconstruct it. Also, because we have a baby, projects that can be done in half-hour increments are probably the only kind of projects we will accomplish anyway. We dream of upping our project time to 45-minute increments…then again, we also dream of sleeping for an uninterrupted 8 hours at a time. I guess you just have to celebrate the small victories in the meantime.